A grand architectural Arbour and Disc structure is located in the pedestrian zone of Commonwealth Games Athletes Village, Gold Coast in Australia. The project is the winner of the sport and recreational category of the Australian Tekla BIM Awards 2018. The Gold Coast is one of Australia’s most rapidly growing cities, in which the imperatives of continual development and change have been driven by its attraction as a tourist destination and by the image of its carefree, laidback lifestyle. The Parklands pedestrian zone in western Southport, that used to have high-quality facilities for harness and greyhound racing, opened in 1988. Two decades later the combined two hundred hectares of Parklands was re-designated in 2013 as a health and knowledge pedestrian zone. Of this, fourteen hectares was reserved as the location of the Commonwealth Games Village and for subsequent housing. The Commonwealth Games Athletes Village is surrounded by recreational gardens and multi-level apartments which were hosting Gold Coast 2018 athletes from 71 Commonwealth countries. At the Village Heart, an activated piazza opens to an artificial lake, which is animated by a sculptural pavilion and water feature called the Disc. The Disc offers shade and evaporative cooling, with water cascading through an oculus above. Winding around this central feature is the twisting yellow structure of an arbour framework that will eventually provide both shade and color around the edge of the piazza space. The reference to a DNA double helix is unmistakable but less obvious is the suggestion that where the implied trail of the DNA string has touched the adjacent buildings, a heightened color imprint or scorching has been left. JMac Constructions contracted Watkins Steel to supply and install structural steelwork for the Arbour and Disc sculpture. With no two parts the same, the in-house drafting team had the complex task of turning the design drawings into something that could be manufactured and erected, as well as communicated easily to the team on the shop floor. "After overlaying the 3D design model into the 3D point cloud model registered from the scan, we discovered that the adjacent building scaffold encroached on the site and clashed with the arbour." Using 3D laser scanning technology, Watkins Steel scanned the as-built site for 100% accurate measurement and clash detection. “After overlaying the 3D design model into the 3D point cloud model registered from the scan, we discovered that the adjacent building scaffold encroached on the site and clashed with the arbour. However, because this problem was caught before installation, we were able to re-adjust the construction program, containing overall project costs and instilling client confidence," said Andy Irwin from Watkins Steel. Using Tekla Structures for detailing, the team was able to efficiently go from design drawings to manufacture and erection. What’s more, the team easily communicated and collaborated in the workshop. The use of the 3D laser scanner proved to be an invaluable Quality Assurance (QA) tool. It allowed the crew to scan each piece after it was assembled so the detailer could overlay a virtual scale model of the assembled piece into the Tekla model. This meant if any errors appeared, they were still well within control to repair or adjust with minimal hassle. The rolling of the large pipe sections was undertaken by the company Inductabend from Melbourne. “We carried out QA by scanning the sections immediately after rolling. 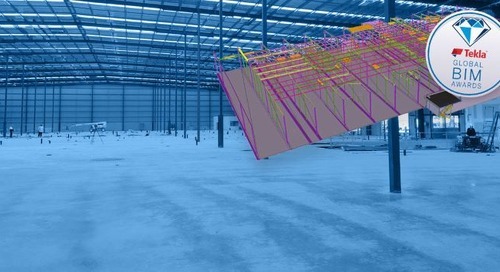 Once scanned, we overlaid the 3D point cloud into the Tekla model and adjusted the model to suit the members, rather than adjusting the steel members to perfectly suit the existing design model,” continued Andy Irwin from Watkins Steel. Installation of the arbour was staged to coincide with the removal of the adjacent building scaffold. Set-out for installation was carried out in tandem with the 3D laser scanner and Trimble Robotic Total Station. Using the scanner, they were able to scan the HD bolts after installation, then overlay it into the Tekla model. This allowed them to alter the length of the columns, orientation of the base plate, and the holes within the base plate where necessary. The Robotic Total Station was then paired with the scanner to provide a measure, a check and a subsequent layout for final installation. This ensured the arbour fit together flawlessly the first time. The arbour structure fit together flawlessly the first time.